Cleans and polishes glass to a streak-free finish! Wolfstein’s Zap Cloth is an ingeniously designed lint-free cloth that is cleans and polishes glass to a streak and haze-free finish, without using any type of cleaner! Wolfstein’s Zap Cloth absolutely, positively, never streaks on glass, mirrors, or windows. Wolfstein’s Zap Cloth is quick and easy to use – all you need is water! Say goodbye to glass cleaners and say hello to the Zap Cloth! Wolfstein’s Zap Cloth is incredibly easy to use. Simply wet it, wring it, and wipe the surface to a sparkling clean, streak-free finish. 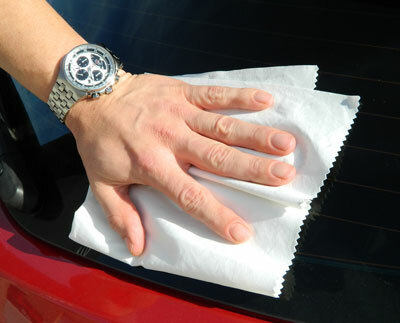 Wolfstein’s Zap Cloth easily removes finger prints, greasy residue, road film, and more! You’ll never have to use window cleaners again! Convertible Top CareRaggTopp Convertible Leather Care KitRaggTopp Fabric Convertible Top Care KitRaggTopp Fabric Convertible Top Cleaner & Protectant Kit RaggTopp Vinyl Convertible Top Care KitRaggTopp Vinyl Convertible Top Cleaner & Protectant KitRaggTopp Fabric/Vinyl CleanerRaggTopp Fabric ProtectantRaggTopp Vinyl Protectant Wolfsteins Tonneau Cover Care KitWolfsteins Tonneau Cover Cleaner Wolfsteins Tonneau Cover Vinyl ProtectantRaggTopp Convertible Top Plastic Window Cleaner & Protectant Kit Free Bonus! Works fine for cleaning windows, it definitely does not leave it streak free. I've used it multiple times and washed it but it still leaves behind a water trail. It's not bad, but it's no magic cloth. I cleaned the bathroom mirrors last week with the Zap Cloth and what an excellent job it did. Before this product, I had to take several passes with cleaners and a bunch of paper towels to clear the haze. Once over and done. Should have way more than 5 stars available! This is the best window cleaning cloth I have ever used! Works as advertised and absolutely does not leave streaks. Clean windows in the hot sun or in the shade. There will be no streaks. Even when it looks filthy it still cleans great. No glass cleaner needed. Best glass cleaning cloth I have ever used. Take it from a guy who hates to clean glass because he just is not good at it. This product works. On excessivly dirty glass you may want to clean with a cleaner first to remove heavy items. This producy requires water only and if used as directed does the job perfectly.